The hospital environment is one where the most extreme of human experiences are played out. They bring in new life, treat people in pain, heal—and sadly many lives will come to an end there. Most of us would expect a hospital site to be a clean and safe environment, where health is paramount. We all know how harmful smoking is so why are hospitals currently one of the few remaining public places where smoking still occurs? Staff from Public Health England’s (PHE) South West centre wanted to understand more about the complex relationship between hospitals and smoking. We invited 11 members of the public, drawn from PHE’s public engagement network, to a focus group in Bristol this summer. The group consisted of both smokers, ex-smokers and non-smokers, who discussed their views and experiences on the rights of staff, patients and visitors to smoke, and explored possible routes to a truly smokefree NHS. An audit of smokefree status across the South West found around half of all Trusts identify as smokefree sites, with policies often having been in place for years. However, every one of these Trusts reported significant problems with ‘enforcing’ a ban— Interestingly all of our focus group members initially concentrated on how best to improve enforcement through measures such as fines, signage and challenging smokers at the outset of the session as the most obvious and visible part of a smokefree site. 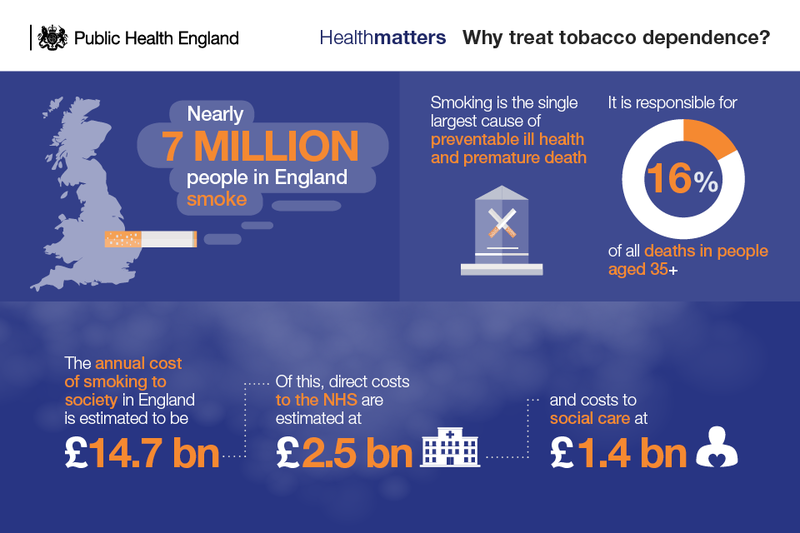 PHE’s interest and commitment is much more about undertaking prevention work and improving compliance —rather than enforcement—as the key to tackling smoking prevalence, both in the community and within hospital settings. PHE want to encourage people in hospital (whether patients, visitors or staff) to stop smoking for good, as opposed to stopping them smoking on site only to continuing smoking once they’ve left. It was, therefore, incredibly encouraging to see attendees also readily exploring ways that hospitals could support patients who smoke to give up. This included making stop-smoking services available on site and staff talking to patients about their smoking during routine check-ups. Rather than seeing this type of intervention as ‘nagging’, the group felt advice from a professional was not only to be expected, but also far more beneficial than if it came from family and friends. They were supportive of e-cigarettes being used on site and suggested making it easier for people to access them, with purchasing options and vending machines at the hospital. The group stressed the importance of all communications with patients before coming to hospital, whether GP visits or letters to patients, making it clear that the hospital is a smokefree environment and offering support to prepare. They agreed that visitors should be encouraged to prepare for complying with smokefree policies when visiting and suggested that nicotine patches be made readily available for both patients and visitors who are stressed at the thought of not being able to smoke on site. Staff behaviour was an important topic of discussion during the session. The group felt strongly that any healthcare staff smoking gives the wrong message and challenged PHE and the NHS to ‘raise the bar’. They argued that not smoking on site should form part of job descriptions and that even off site hospital staff should be discouraged from smoking whilst wearing uniform. The group did recognise that staff may have as complex reasons for smoking as patients and so should be offered a range of tools to help them be smokefree on shift, ranging from free advice, counselling and medication, to a dedicated room for someone to meditate or relax, a helpline, and a buddy system. And of course be offered every support to quit for good. They felt that smokefree sites were much more likely to succeed if visible leadership was given to the campaign, and in particular nurses as ‘key leaders’, noting the expectation of high standards of practice and the fact that this is powerful in encouraging staff not to smoke. PHE’s commitment to inspiring a ‘smokefree generation’ was brought into sharp focus when an attendee who had recently become a mother described the moment she took her first steps with her new-born baby out of the maternity ward. She described her experience of walking straight into ‘clouds of smoke’ created by people smoking directly outside the hospital entrance. The group felt strongly that prevention rather than cure was the best approach, particularly encouraging children not to start smoking. The influence of smoking on children was a huge concern to the entire group, among both smokers and non-smokers, with the smokers unanimously agreeing that they would never smoke around children. It was felt that the smokefree campaign should start by actively focussing on anywhere where there will be large numbers of children, in particular children’s hospitals and maternity wards. Attendees recognised that pregnancy is a powerful incentive to giving up smoking and were heartened to hear from a group member—a female smoker who had given up during pregnancy—of a conversation between her and a health professional. The health professional could see on the patient’s notes that she was an ex-smoker and without prompting asked if she required support to continue along this path after giving birth. There was strong support for advice not only within the hospital setting but also once the patient was discharged. 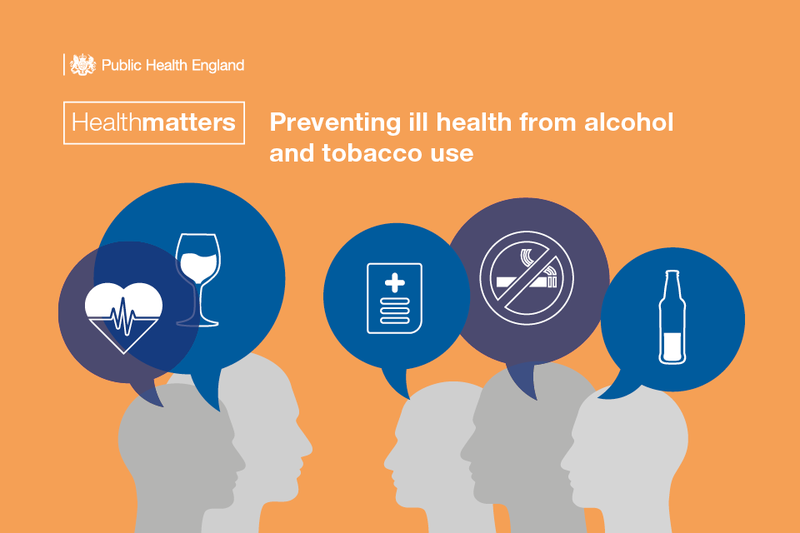 Addressing the issues raised in the group is vital to the success of a truly smokefree NHS. The Government and NHS England have both made commitments to a smokefree NHS, in the latest tobacco control plan and the five year forward view respectively. But, for this to become a reality hospitals must support all patients, carers, visitors and staff who smoke to start their quitting journey. That’s why our emphasis is to support Trusts in shifting efforts away from simply ‘enforcement’ and rather towards garnering support and continually finding ways to improve ‘compliance’. This means leading with ensuring that every clinician is having conversations with smokers and providing them with a route to quit; if a Trust is doing this, smokefree grounds will help to support ‘compliance’. Over the coming months Trusts and Healthwatch will all be conducting their own local research to help them understand more about the barriers to going smokefree, and what alternatives they can offer patients to help them quit or prepare. What is encouraging from this focus group is that all attendees agreed that hospital sites should be smokefree – the challenge at hand now is to keep going, finding new and innovative ways to bring patients, staff and visitors along on the journey. For further information and resources, including self-assessment tools to help Trusts develop their own action plans, please visit PHE’s campaign resource centre. 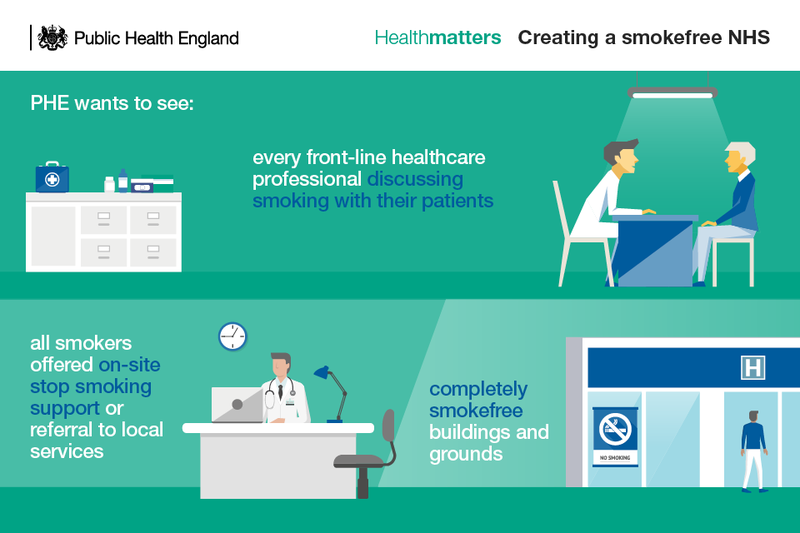 Read more about how to achieve a smokefree NHS in the latest edition of Health Matters which includes a set of infographics and slides to support local commissioning and service delivery, as well as best practice case studies.